What do the Milky Way's billions of Earth-like planets really look like? The latest estimates suggest there are at least 160 billion exoplanets in the Milky Way alone, which means there could easily be several billion potentially habitable worlds in our galaxy. But are all these Earth-like planets really like our home? That's the question an international team of astronomers are attempting to answer. While we've still only discovered a handful of rocky planets in our exoplanet hunting - though that number is increasing all the time - we can look at the composition of the clouds of dust and gas in young solar systems that ultimately coalesce into planets. By looking at the very beginnings of these planetary systems, astronomers can make some shrewd guesses about how Earth-like planets will ultimately form. According to the researchers, there are two key chemical ratios that determine the ultimate composition of terrestrial planets and, by extension, their suitability to support life. The first is the ratio of carbon and oxygen. 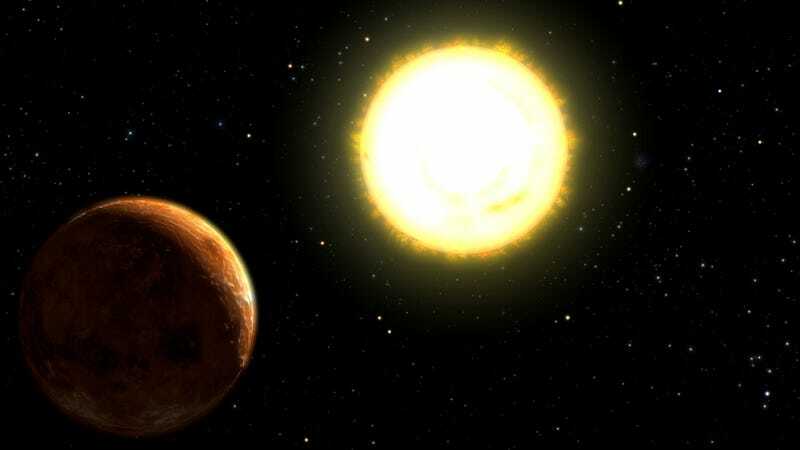 While the compositions of Earth, Mars, and Venus all slant towards oxygen, it's perfectly possible for planets to form in discs that are poor in oxygen and rich in carbon, resulting in what are often nicknamed diamond planets. The heat transfer of such planets would be so fast that the interior would freeze, likely making life impossible on such worlds. The second ratio is that of magnesium and silicon. Earth has a roughly even amount of both elements, with slightly more silicon. But planets with significantly more silicon than magnesium would lead to very different mineralogical compositions in the interior of the worlds, causing radically different kinds of plate tectonics, atmospheres, and volcanic activity that would be far less conducive to life, if not preclude it entirely. "There could be billions of Earth-like planets in the Universe but a great majority of them may have a totally different internal and atmospheric structure. Building planets in chemically non-solar environments (which are very common in the Universe) may lead to the formation of strange worlds, very different from the Earth! The amount of radioactive and some refractory elements (especially Si) may have drastic implications for planetary processes such as plate tectonics and volcanic activity." This work is still relatively in its infancy, so we can't yet say with certainty what percentage of rocky planets are truly Earth-like. The key there will be to figure out the average abundance of these different elements in our galaxy's countless solar systems. But that's not an easy task - right now, all we can say for certain is that there appears to be gigantic variance between different solar systems, with some featuring carbon/oxygen and magnesium/silicon ratios that are perfect matches for our solar systems, and others that are totally exotic. It seems the galaxy is capable of far more variety than we ever imagined, and Earth may be far more uncommon than we might have hoped. The more star systems we survey, both those with and without planets, the more we will understand about just how weird our galaxy's planets can really get. It may well turn out that only a small percentage of planets could ever actually hope to support life as we know it. But of course, that also raises an intriguing possibility - as we learn about planets that are nothing like Earth, we might be able to start properly imagining life as we don't know it. Astrophysical Journal. Artist's conception of 55 Cancri via NASA.